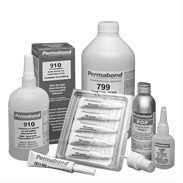 Permabond cyanoacrylate adhesives bring a wide variety of performance benefits to the production environment. These benefits include joining dissimilar and hard-to-bond materials, quick curing with very strong adhesion and a wide range of viscosities. Permabond one-part cyanoacrylates are a versatile solution for even the most demanding manufacturing and assembly applications. You can search on request , or product name you will find on link "More". How do Permabond cyanoacrylate adhesives work? adhesives are formulated to bond a variety of porous and non-porous surfaces and to rigid or flexible materials. • Fast, 30-second cure time; speeds production rates. • One-part adhesive chemistry speeds application for use in vertical application. • Join dissimilar materials, such as rubber to metal with no compromise in bond strength. • Cures in seconds at room temperature; eliminates need for costly jigs or ovens; accelerates assembly rates. • Solvent free; non flammable. • Superior bond strength; often exceeds that of substrate material. • Impact resistant grades increase durability. • Permabond surface activators pre-treat acidic surfaces to facilitate and speed cure.They can also be used post application to quickly cure any exposed cyanoacrylate to eliminate blooming. The information given and the recommendations made herein are based on our experience and are believed to be accurate. No guarantee as to, or responsibility for, their accuracy can be given or accepted, however, and no statement herein is to be treated as a representation or warranty. In every case we urge and recommend that purchasers, before using any product, make their own tests to determine, to their own satisfaction, its suitability for their particular purposes under their own operating conditions.